New Labor Forum is a national labor journal from the Murphy Institute and the City University of New York. Published three times a year, New Labor Forum provides a place for labor and its allies to test and debate new ideas. Issues we explore include (but are not limited to): the global economy’s impact on work and labor; new union organizing and political strategies; labor’s new constituencies and their relationship to organized labor’s traditional institutions; internal union reform and new structural models for the labor movement; alternative economic and social policies; and the role of culture in a new, revitalized labor movement. 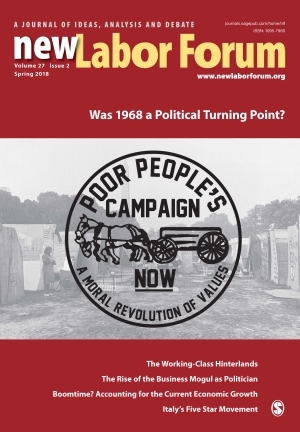 Read the latest issue or subscribe to New Labor Forum.